Photo credit: delgaudm. Licensed under a Creative Commons Attribution 2.0 Generic license. 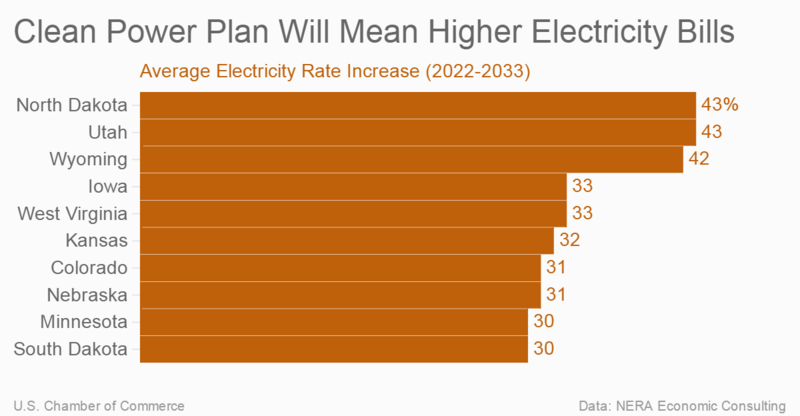 10 states will see average electricity rate increases of at least 30% because of EPA's Clean Power Plan. Expect to pay higher electricity rates because of EPA’s carbon regulations. NERA Economic Consulting modeled the final version of EPA’s Clean Power Plan for the American Coalition for Clean Coal Electricity. NERA economists expect an 11% to 14% increase nationwide in electricity rates between 2022 and 2033. Even EPA acknowledges its carbon regulations will mean higher electricity rates. What do higher rates mean for consumers? According to NERA, American households will have $64 billion to $79 billion less to spend. It’s simple. More money for energy means less money available for food, health care, and other necessities. At the same time we will be paying more for electricity, there will be less electricity to go around. NERA finds that EPA’s carbon regulations will force the retirement of as much as 19% of coal-fired power generation by 2033, reducing the total electrical generating capacity of the U.S. by as much as 10%. Higher electricity rates and a lowered supply of generation capacity. How is this any good for an economy dependent on affordable, reliable energy? The plan’s projected cost of at least $29 billion annually is three times greater than the cost of EPA’s Mercury and Air Toxics rule, to which the U.S. Supreme Court stated, “It is not rational … to impose billions of dollars in economic costs in return for a few dollars in … benefits.” The benefits of the CPP are miniscule, reducing global carbon dioxide emissions by less than 1 percent and global temperatures by 0.02 degrees Celsius by 2100, according to EPA’s own models.